Off Highway Vehicle(OHV) enthusiasts can find plenty of opportunities on Georgia's two National Forests to practice their rigorous sport. The Chattahoochee National Forest located in North Georgia, and the Oconee National Forest located in Central Georgia, are popular with individuals and family groups that want a scenic and often challenging ride within the National Forest. The Chattahoochee-Oconee National Forests feature nearly 867,000 acres across 26 counties, hundreds of miles of clear-running streams and rivers, 850 miles of recreation trails, and dozens of campgrounds, picnic areas, and other recreation activity opportunities. These lands are rich in natural scenery, history and culture. The mission of the USDA Forest Service is to sustain the health, diversity, and productivity of the nation's forests and grasslands to meet the needs of present and future generations. The Chattahoochee-Oconee National Forests is part of the Southern Region, with the Forest Supervisor’s office in Gainesville, Georgia, managing four District units in Blairsville (Blue Ridge District), Lakemont (Chattooga River District), Chatsworth (Conasauga District), and Eatonton (Oconee District). Trail access is however becoming more and more limited. This is due to a variety of causes. What's important to remember here is that we must all be responsible for our actions, to have a plan and stick to it. First identify the name and geographic area you want to wheel. Then check and see if the area you are planning to go off road is open. The forest service provide consistent updates on their website. Remember that some legal off road trails still have seasonal or weather related closures and may not be open year round. Then check the weather and make sure that your vehicle is capable of handling adverse conditions should the weather turn on you while on the trail. This causes added erosion and will become more challenging for both the vehicle and the driver. Next, you should download or print a map of the area and preview it before you depart. Staying on the designated route and avoiding off shoots which may or may not be marked is vital to preserving access to these rare and beautiful public lands in OHV's. Public Forest Service roads are in the spotlight all across the country and we need to all be aware that if we create a negative image and do not obey the rules set forth by the local government to these trails then our future generations may not be able to enjoy them. The Chattahoochee-Oconee National Forests operate under motor vehicle laws set by the State of Georgia. This means that anyone operating an OHV on a Forest Service road (including dirt/gravel roads) must follow all State vehicle laws and must have a valid driver's license. OHVs that are not street legal must remain on designated trails marked specifically for OHV use. Some trails are restricted for a certain type of use such as only motorbikes or only four-wheel drive vehicles. These restrictions are set for safety reasons and to meet the special needs of each type of vehicle. State law requires all vehicles and drivers to be licensed before operating on public roads. Therefore, unlicensed vehicles and drivers can only ride on designated OHV trails. OHVs may not be operated in a manner that damages or unreasonably disturbs the land, wildlife, or vegetation. Violators of these restrictions are subject to fines of up to $500 and/or up to six months in prison. Rules are necessary to make sure your riding adventure on the National Forest is fun, safe, and will continue to provide a quality riding experience. Please help by obeying these rules. Some trails require you to pay a daily fee. Details are available at the fee stations near the trail head. While riding at fee sites, you must carry your permit with you. Stay on OHV designated trails. Make sure your vehicle has an operating and effective spark-arresting device. Vehicle must not emit a noise greater than 86 decibels at 50 feet while traveling 35 miles per hour or less. When traveling over 35 miles per hour the noise level must not exceed 90 decibels at 50 feet. Conform to State laws and regulations regarding safety equipment for operating vehicles on public roads and highways. Operate licensed vehicles on forest roads safely and cautiously, respecting the rights of others. Operate licensed motor vehicles on a forest road only with a valid driver's license. Do not operate motor vehicle while under the influence of alcohol or drugs. Do not shortcut switchbacks on roads or trails. Operate motor vehicles on designated OHV trails ONLY if of legal age to obtain a State drivers license or accompanied by a legally licensed driver. Make sure your vehicle has operable braking system. Do not create excessive smoke. Do not operate in a manner that damages or unreasonably disturbs the land, wildlife or vegetation. 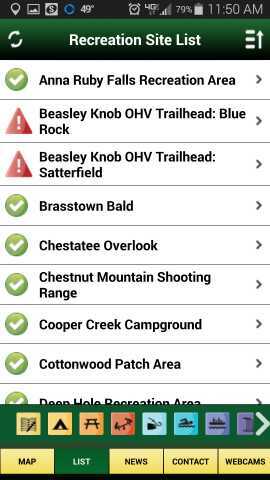 Get the Official USFS Mobile APP compatible with All Android and IOS Smart Phones and Tablets online today. It's entirely free. 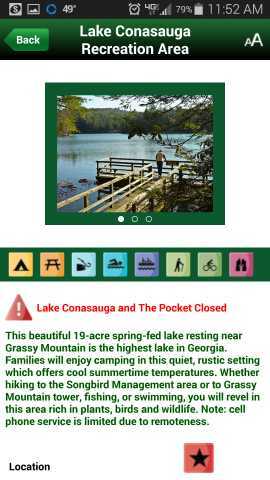 This is the official mobile app for the Chattahoochee-Oconee National Forests focused on outdoor recreation information. Intended for anyone who visits Georgia’s two national forests, the app is equally useful for people who regularly visit the forest and those who are exploring the forest for the first time. Now you can have all the information you need in the palm of your hand to help you navigate and experience Georgia’s two national forests. This FREE app includes 48 recreation sites and provides information about their facilities and opportunities for hiking, camping, picnicking, fishing, swimming, boating, off-roading, horseback riding, mountain biking, and sightseeing. The app is free and is available for Apple and Android smartphones and tablets. Sliding row of activity icons - Select the icons for the activities that interest you and the app will display the recreation sites that offer the combination of activities you have chosen. You can also view your favorite rec sites by selecting the appropriate icon at the end of the row. Interactive map – Recreation sites are shown as markers based on the combination of icons you choose in the activity slider. Icons at the top of the screen provide help and allow you to reset the map and pinpoint your current location. List view – Recreation sites can also be viewed as a scrollable list that can be filtered by activities and sorted. News & Information – Stay informed about current forest news, events and alerts. The Forest Service publishes maps each year showing the legal trails on the public land they manage. They are called MVUMs. That stands for Motor Vehicle Use Maps. They are available online for every National Forest and on BLM managed lands. 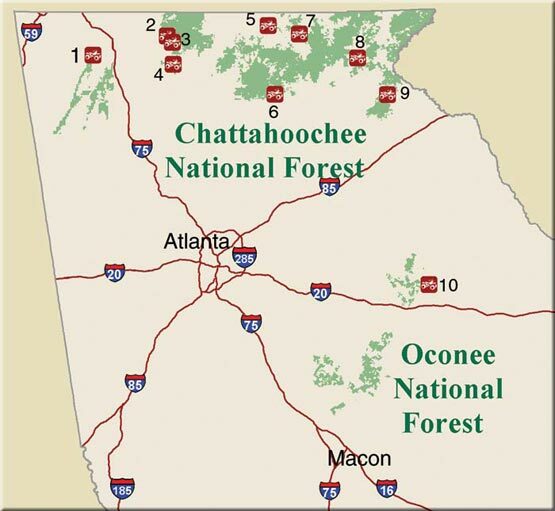 The motor vehicle use map for the Chattahoochee-Oconee National Forests is available free of charge at USDA Forest Service offices in Gainesville, Blairsville, Chatsworth, Lakemont, and Eatonton, Georgia. The motor vehicle use map is a black and white map that displays only the roads and trails open to motor vehicles. People looking for recreational opportunities should use other national forest maps, such as the forest visitor map, wilderness maps, or the trail guide, that show motorized and non-motorized roads and trails (hiking, biking, horse) as well as recreation sites. These maps show a much greater range of information than shown on the motor vehicle use maps. NOTICE: See the list of trails below for where you can ride. In the Chattahoochee and Oconee National Forests, you can only ride on trails designated for the purpose of off-road riding. For complete details, please see the OHV Rules and Regulations. Trail locations as displayed on the above map. Map and trail information links are property of the US Forest Service.